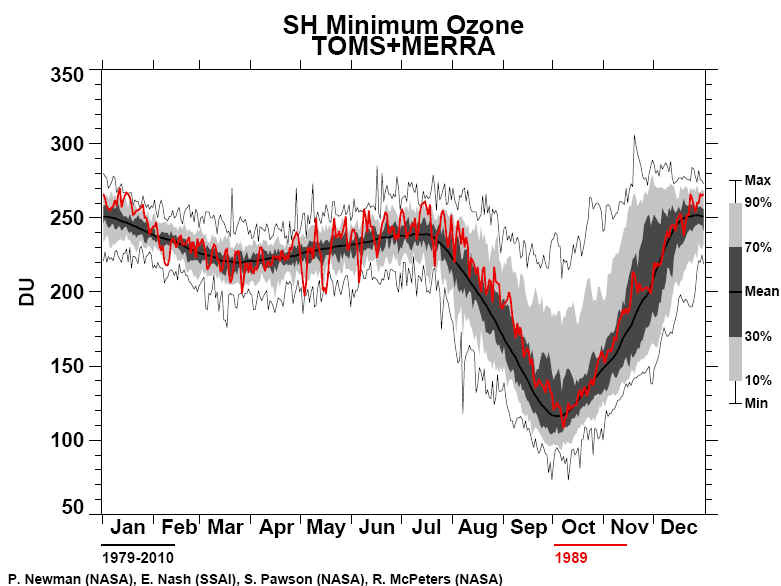 In 1989 the Total Ozone Mapping Spectrometer (TOMS) aboard the Nimbus 7 satellite observed the springtime decrease in Antarctic total ozone for the 11th consecutive year. 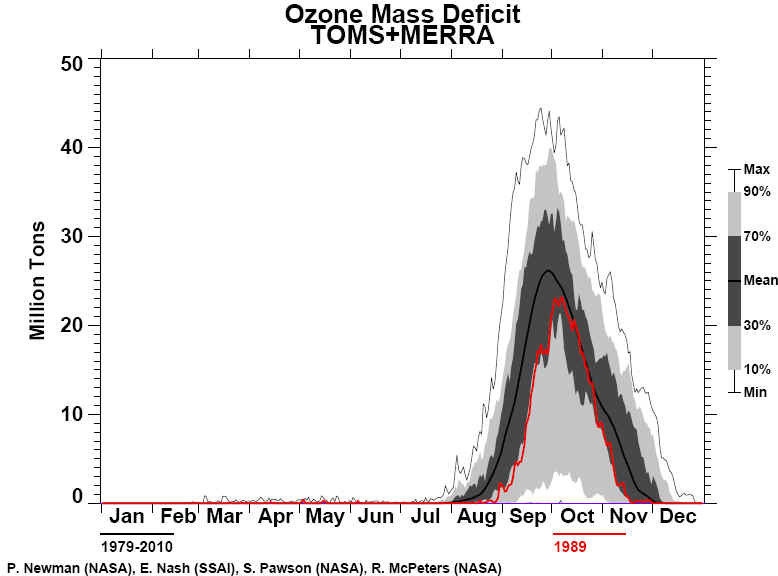 The 1989 minimum values of total ozone measured by TOMS declined throughout the month of September at a rate nearly identical to 1987. The National Meteorological Center analysis of lower stratospheric temperatures in August and September 1989 also showed conditions similar to those observed in 1987. A minimum in total ozone of 111 DU was reached on October 7, 1989. Within uncertainties this is the same as the previously observed minimum on October 5, 1987. 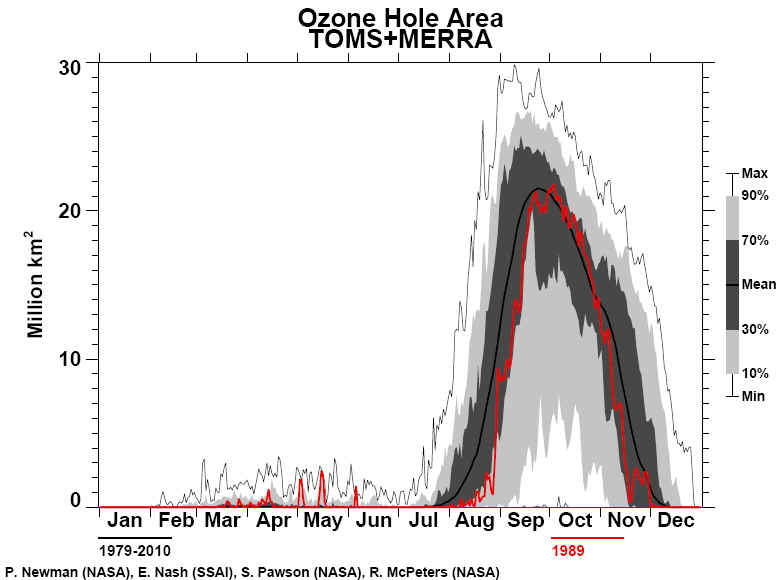 The area of the ozone hole as defined by the 220 DU contour grew rapidly during early September. It reached a mid‐September peak of 7.5% of the southern hemisphere or 19 million square kilometers, essentially the same as observed in 1987. 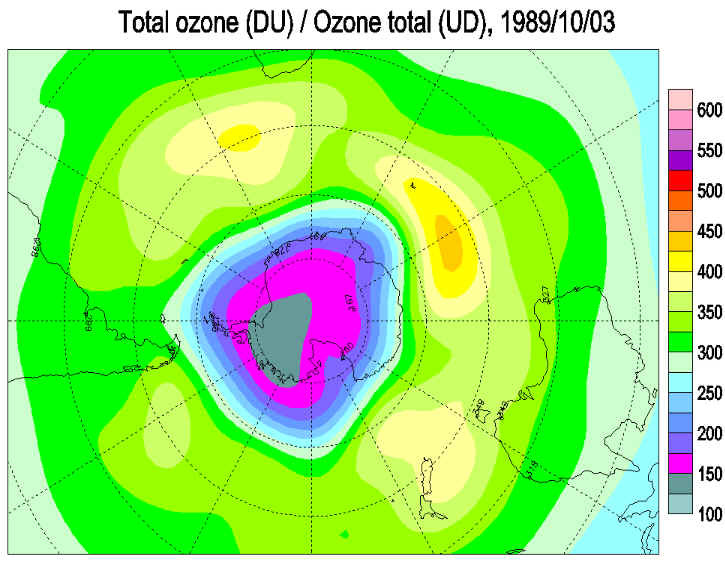 From mid October through November 1989, minimum polar total ozone values increased and the area within the 220 DU contour decreased more rapidly than during the comparable period of 1987. 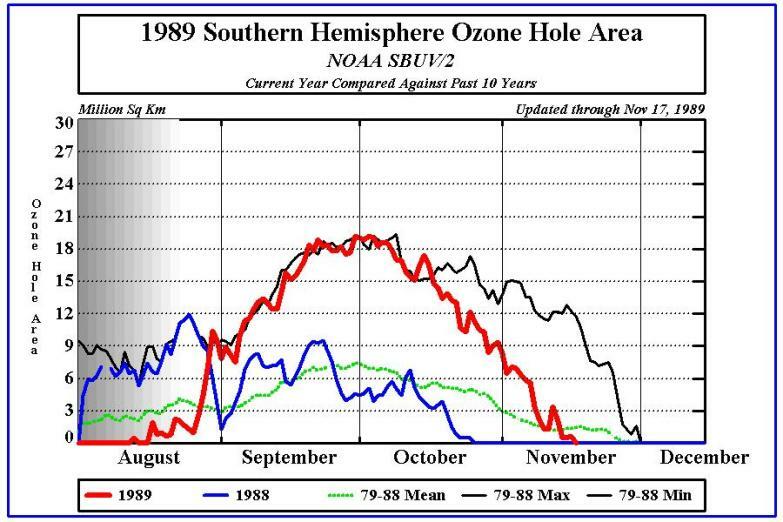 The more rapid erosion of the 1989 ozone hole resulted from strong wave number one perturbations of the vortex dynamics in late October. A hole has opened in the atmosphere's ozone shield above Antarctica, and scientists said yesterday the hole was growing at the same rate as one in 1987, which broke records and alarmed environmentalists. The existence and rapid growth of the latest hole was discovered by the National Aeronautics and Astronautics Administration's Nimbus 7 satellite and confirmed by balloons launched from ground stations in Antarctica. Ozone in the Earth's stratosphere normally blocks most ultraviolet radiation arriving from the Sun, and thereby shields people and wildlife from harmful radiation effects. But certain chemicals released into the air -chlorofluorocarbons used in refrigerators, air-conditioners, spray cans and fire extinguishers - are destroying stratospheric ozone. Scientists fear an epidemic of skin cancer, eye cataracts and other radiation-induced diseases will result. 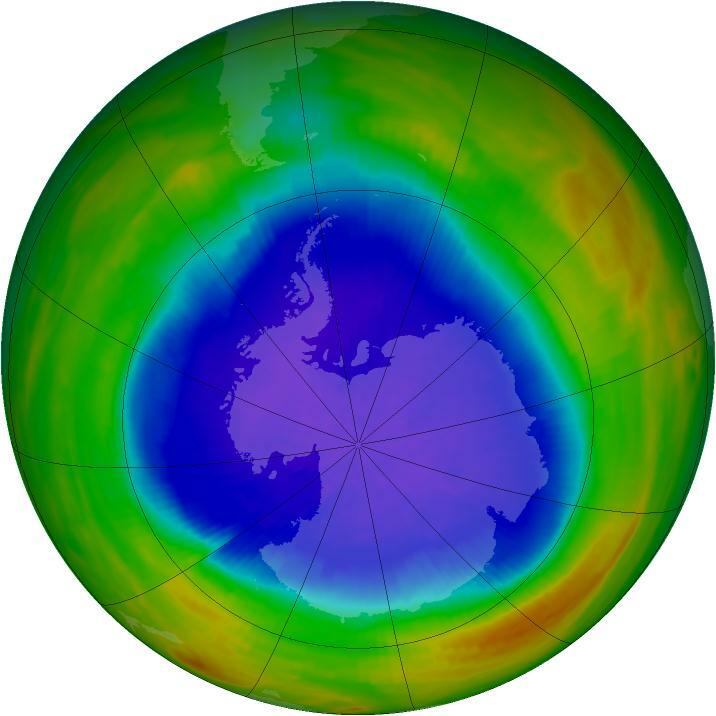 The 1987 ozone hole over Antarctica caused concern not only because of its effects on local wildlife but also because the ozone depletion it represented was eventually distributed throughout the Earth, exposing the planet to greater ultraviolet radiation. The ozone hole over Antarctica and a smaller hole over the Arctic have become seasonal occurrences, opening in springtime and closing with the onset of winter. The size of the hole and degree of ozone depletion vary from year to year, and scientists expected from some mathematical models that the next very large ozone hole over Antarctica would occur in 1990. The appearance of a huge hole this year therefore came as a surprise. The strength of the ozone shield is measured in Dobson units (named for the late British aeronomist G. M. B. Dobson), which express the amount of ozone in the atmosphere over a square centimeter of ground. The normal ozone measure is about 350 Dobson units, but in Antarctica, the level fell on Oct. 5, 1987, to 109, a record low. Mr. Lynch said that NASA measurements put the current level over Antarctica at 150 and that the rate of decline suggested the hole would reach a size identical to that of 1987. The United States has led the world in curbing further pollution of the atmosphere by ozone-destroying chemicals. The American Government was the first to bar the use of chlorofluorocarbons as propellants in spray cans, and since July 1, American manufacturers have been required to restrict their production of ozone-destroying chemicals to 1986 levels. But even if a total global ban on such pollution could be imposed, depletion of the ozone layer from residual chemicals is expected to continue for many years. All methods of measurement agree that this year's Antarctic hole will be several times larger than the continent itself, Mr. Lynch said. Ozone holes are believed to form when circular stratospheric winds surround regions where high-altitude ice crystals initiate a chain reaction. In this reaction, chlorine from pollutant gases is used over and over again, destroying vastly greater amounts of ozone.